Squats are tough, but useful for strength training and weight loss. One of the contributing factors to the development of obesity is a sedentary lifestyle or physical inactivity. Despite the effectiveness of weight loss surgery and other interventions and devices that are available for the management of obesity, the need to comply with the dietary adjustment and lifestyle modification has been established as the primary requirements for optimal weight loss following bariatric surgery. With lack of adequate exercise, the expected weight loss will not be achieved, and the overall well-being of the patient will also be suboptimal. Under an ideal setting, the training is usually commenced before the surgery. This will ensure that you are already adapted to the type of exercise and will find it easy to sustain following bariatric surgery. The benefits of exercise include but not limited to increasing energy expenditure and lean body mass while contributing to fat loss, reducing obesity-related complications, and improving self-esteem and depression (Livhits et al., 2010). Different ranges of exercise are available for obese patients. Although no standard guideline has been established in regards to the degree of activity that is appropriate for people who have just undergone bariatric surgery. However, some experts suggest that daily walking is adequate and patients can make use of pedometers to track their activities. The recommendation of The American Society for Metabolic and Bariatric Surgery (ASMBS) is that mild exercise (including aerobic conditioning and light resistance training) 20 min/day 3–4 days/week before bariatric surgery will improve cardiorespiratory fitness, reduce the chance of surgical complications, enhance healing and postoperative recovery (King & Bond, 2013). The recommendation of The American Heart Association (AHA) is also similar to that of ASMBS. After about 4 weeks postoperatively Egberts et al. carried out a study and found that aerobic and strength building exercises for 45 min/3 times a week resulted in a better excess weight loss (37%) and change in percentage body fat (3.6%) against the other group of people in the usual care group (27% and 1.6%, respectively) (King & Bond, 2013). 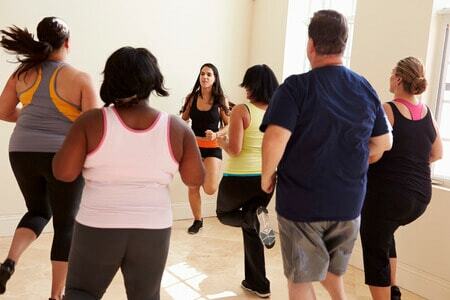 Apart from walking, other exercises that you can engage in after bariatric surgery include cycling, Yoga, dancing, swimming jogging, light weights and aerobics classes. Begin your exercise gradually and gradually increase it as much as you can cope with. Work with a partner with the same purpose as yours. This person may be a source of motivation for you. Disregard the pain of muscle soreness that may occur when you start your exercise. Remember “good things don’t come quickly.” If the pain becomes unbearable, relax for some minutes and continue your training. Join groups that are involved in exercise for physical fitness. Jogging. It will speed-up weight loss. Lack of physical activity is one of the contributory factors to obesity. After becoming obese, physical exercise becomes a difficult task to initiate and sustain. Thus, a vicious circle is established. A sedentary lifestyle is a significant risk factor for cardiovascular diseases (myocardial infarction, stroke); the number one leading cause of death globally. The obesity caused by lack of physical activity is a risk factor for the development of certain types of cancers; another leading cause of mortality. Diseases associated with obesity such as hypertension, type 2 diabetes mellitus, sleep apnea, dyslipidemia (increase in the blood level of bad lipids), and osteoarthritis negatively affect the quality of life of obese individuals and also increase their health care spending. Despite the popularity of bariatric (weight loss) surgeries as the panacea to the menace of obesity, a significant proportion of obese individuals still fail to lose the adequate amount of weight even after undergoing the adjudged most effective weight loss surgery. This has been found to be connected to the lifestyle of these obese individuals after weight loss surgery. Part of the non-surgical ways of achieving weight loss in obese people is to adjust their diet and increase their physical activity (exercise). Adjustment of the diet helps prevent the accumulation of more fat while training ensures that the accumulated fat is broken down to produce energy. While weight loss surgeries seem to augment the dietary aspect by either reducing the quantity of food intake or reducing absorption, it does not affect the aspect of physical activity. All the above point to the fact that, increase in physical activities (exercises) is an irreplaceable component of achieving weight loss. It must be initiated before and maintained after the weight loss surgery if a satisfactory weight reduction is to be attained. An adequate exercise after weight loss surgery will ensure more weight loss, improvement in comorbid conditions, decrease in the cardiovascular risk factors, reduction in healthcare spending, improvement in the quality of life and overall survival. No universally acceptable guideline on the type and degree of exercise that is appropriate for patients after weight loss surgery. Nevertheless, experts have suggested that walking alone may be adequate. This can be quantified with the use of a pedometer (a portable electronic device that counts the number of steps taking while walking), this must, however, be calibrated before use. Aerobic exercises for at least 20 minutes in a day in 3-4 days a week has been found to improve cardiorespiratory fitness. This is the recommendation of the American Society for Metabolic and Bariatric Surgery (ASMBS) and the American Heart Association (AHA). In the work of Egberts et al., a higher weight loss was reported 4weeks after bariatric surgery in patients that engaged in aerobic exercises for 45minutes/day for 3times/week. Other useful exercises aside walking include: yoga, swimming, bicycling, etc. the duration and extent should be determined by your physician based on your state of recovery. The post-bariatric surgery period is characterized by emotional feelings that may negatively impact compliance with the dietary and exercise plan. However, you need to ensure this transient period by making sure that you adhere to the training plan as prescribed by your physician. Join bariatric surgery forum where you can meet people with the same goal as such people may serve as sources of motivation for you. Ensure the initial pain and muscle cramps that may occur during exercise. They are transient and will soon subside. Have daily, weekly, and monthly targets to monitor how well you are doing with your exercise. Don’t give up until you achieve your goal. In conclusion, exercise is no doubt, an essential ingredient to achieving optimal weight loss after bariatric surgery. It also improves the cardiovascular health and reduces the risk of death. The secret is to start small and progress gradually till your goal is achieved. King W, Bond D. The Importance of Preoperative and Postoperative Physical Activity Counseling in Bariatric Surgery. Exercise and Sports Sciences Reviews. 2013;41(1):26-35. doi:10.1097/jes.0b013e31826444e0.